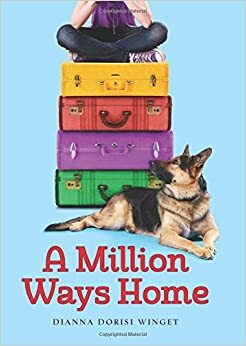 A Million Ways Home by Dianna Dorisi Winget is about a girl named Priscilla Parker who’s nickname is Poppy. Poppy’s grandmother, who is also her legal guardian, ends up in the hospital. Subsequently, Poppy has to live in the children’s center which she hates because she has a snobby roommate who steals her stuff; her cell phone and pillows. One day,Poppy decides to go see her grandmother without an adult supervisor. She can’t quite remember the way to the hospital and she gets lost and soon she finds herself in the middle of a crime. As a result, Poppy needs to be protected, so she starts living with Detective Brennigans mom. Poppy was a little fearful because she is living with someone she has never met before. Poppy eventually becomes friends with a girl named Lizzy who works for the Brennigans and is in some trouble of her own. She also becomes close with a dog named Gunner who may be put down because he bites people. Poppy has to learn to adjust to her new life and help hunt down a criminal. A Million Ways Home is a book filled with amazing characters it also has great setting descriptions. One character was Lizzy who is Poppy’s new friend , she is mysterious, unwelcoming, and quite a rebel. She usually keeps to herself but, some how Poppy gets Lizzy to open up about her feelings.Poppy tells she about everything going on in her life. Lizzy’s feelings towards her mom, Poppy , and everyone around her change. Lizzy becomes a happier, friendlier person as the book progresses. The settings in A Million Ways Home are described in depth. For instance in a scene at the gas station I could picture her at the station. The author describes it as old and dusty. The descriptions and the mood of scene helped to set the tone of the story. I recommend this book to middle schoolers looking for a quick read, great characters, and a descriptive setting.